With The Sinestro Corps War and Final Crisis very swiftly behind them, both Green Lantern and Green Lantern Corps begin gearing up for Blackest Night. Green Lantern tackles the Red Lanterns, while Green Lantern Corps: Sins of the Star Sapphire focuses on the "don't call them Pink" Lanterns. Of the two titles this go-around, I found Green Lantern Corps to be the more effective; writer Peter Tomasi struggles sometimes in his dialogue and interaction between the Lanterns, but wraps it up in a plot that, like his last volume, I found imminently gripping. Tomasi's big accomplishment in this collection is to make me fear for the character's lives. The Star Sapphire story has less really to do with the Sapphires than with the Lanterns' search for the baby-stealing Sinestro Corps member Kryb. That Kryb kills the Lanterns and kidnaps their babies is creepy enough, but Tomasi introduces Kryb's mind-control power that, at one point, forces four Lanterns to hold down a pregnant fifth Lantern as Kryb prepares to slice her open. As in the previous volume, Ring Quest, Tomasi combines well superheroics and science-fiction horror, and there's no lack of adrenaline as the Lanterns fight Kryb for their lives and the lives of their children. 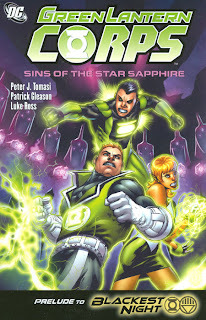 As Geoff Johns does in Green Lantern, Tomasi uses the emotional spectrum of the new Star Sapphire corps, "love," as the underlying theme of the story. The married Lanterns fight to protect each other and their children, Lanterns Kyle Rayner and Soranik Natu consider a relationship, and Guy Gardner reunites with long-time love Ice. Somewhat predictably, the Guardians outlaw love between the Corpsmen just as these storylines reach their climax, but Tomasi surprised me in the end with the unexpected fallout of the Guardian's decision. Even as the plot of Sins of the Star Sapphire held my interest, I found that Tomasi still struggled getting in to the story, especially in his dialogue between Kyle Rayner and Guy Gardner. Guy, as we know, is a "guy's guy," and Tomasi seems to try to write "guy dialogue" here, but it comes out rather flat and unreal -- as in Ring Quest, the character's repeat one another ("Helluva first night, buddy," Guy says. "Helluva first night," Kyle repeats, in two panels we could have done without). Similarly the attraction between Rayner and Natu is meant to drive the end of the story, but as they've rarely interacted all that much so far, it seemed more something "told" to the reader than something we actually felt. There's only one more Green Lantern Corps collection (the controversial Emerald Eclipse hardcover) before Blackest Night, and my hope is that Tomasi will turn his attention away from the Lanterns he's spotlighted so far. Rayner and Gardner headline the series, we know, and we've seen Natu, Arisia, and Sodam Yat, but early favorites Isamot Kol and Vath Sarn, the Rann/Thanagar odd couple, are nowhere to be found, nor have we ever learned much more about Natu's supposed partner Iolande. Here's hoping Tomasi gets a chance to feature them before the crossover takes hold. In all, Tomasi's Green Lantern Corps promises to be a worthy companion to Geoff Johns' Green Lantern, even as the book still works to find its footing. I'll be curious to read Tomasi's Outsiders not too long from now and see how that holds up. What's included in Morrison's JLA Deluxe?